I feel lucky to have a life 100% dedicated to books - I write, edit, publish and work directly with young children and their families. I'm best known as the author of the Lulu/Lola books, though I've written over 25 picture books. I'm also Editor at large at AlannaMax. In the UK, the Lulu and Zeki books are books are published by AlannaMax. In the US, Lola and Leo books are published by Charlesbridge Publishing. The Lulu & Zeki books are also published in Denmark by Forlaget Arvids, in Netherlands by Luister, in Brazil by Pallas in Sweden by EPIX and in Korea by Glburri. My books are also published by Chicken-House/Scholastic, Barefoot Books, Little Tiger, Annick Press and O'Brien Press. As well as writing, I am Editor at Large at AlannaMax (I founded Alanna Books in 2006 and the new, more exciting list has Ken Wilson-Max as Publisher. And it's on the North Somerset Teacher's Book Award longlist. Links to blogs are on the right. 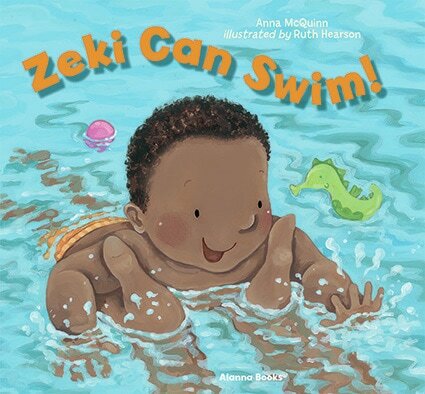 Zeki Can Swim has been nominated by IBBY UK for the International IBBY's List of Outstanding Books for Young People with Disabilities 2019. Reviews of both the US and UK editions are here. click to visit or get recommendations. I blog and write about gender, diversity and inclusion. Read my blog or click on the links below to read more. It's NOT what kids want! hit $1million in the USA in 2016. I write, edit and publish books for young children. in the stories they read, so I try to include a wide range of children and experiences in my stories.